The best-selling Stampede was the first high-performance monster truck and it's legendary ruggedness has made the Stampede name synonymous for monster truck driving fun. 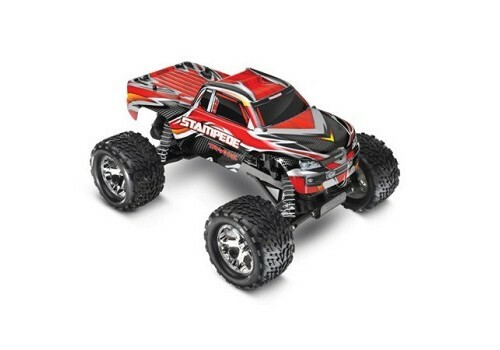 Combine the increased horsepower with the tall, drive-over-anything ground clearance; ultra-tough suspension; and easy operation, Stampede will quickly become your favorite for all kinds of monster truck action. Stampede is still the first name in high-performance monster trucks. The Stampede is one monster truck that doesn’t know when to quit! Crushing cars, catching big air, and popping wheelies have never been this much fun. There is no other truck available that offers Stampede’s unique style, capability, and reputation for durability. When it comes to speed, the Titan 12-turn 550 modified motor and racing-style Magnum 272™ transmission propel the Stampede to speeds over 30mph*. The integrated cooling fan in the Titan 12T pulls air through the motor keeping it cool. Airflow is routed through cooling channels molded into the motor plate. A cooler running motor delivers faster speeds, longer runtime, and extended motor life.